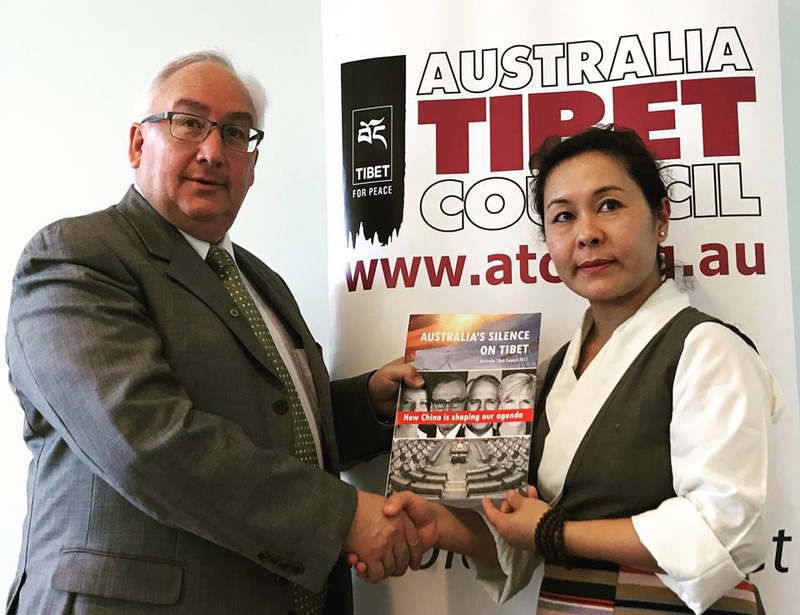 Australian MP Michael Danby with ATC Campaigns manager and Tibet MP Kyinzom Dhongdue at the launce of the report at Parliament House in Canberra, Australia. Sept. 13, 2017. (TibetanReview.net, Sep17, 2017) – Increased Chinese influence in Australia’s political and educational institutions has led to corresponding diminishing of Canberra’s engagement on Tibet, said a new report by the Australia Tibet Council on Sep 13. “As Chinese influence increases in Australia, explicit support from the Australian Government for Tibet has diminished. The Government’s silence on the human rights crisis in Tibet is notable, with not a single public statement on Tibet being issued for nearly a decade,” says the 28-page report. “Furthermore, no Australian Prime Minister has met the Dalai Lama since 2009, although he has made five subsequent visits to Australia,” the report points out. The report, Australia’s silence on Tibet: How China is Shaping our Agenda, was released in the Australian Parliament House in the presence of MPs, including Senators Lisa Singh and Dean Smith, and MPs Michael Danby, Mike Freelander, and David Feeney. The report shows that covert pressure at universities, increasingly dependent on Chinese funding, has produced a culture of self-censorship in the Australian academic community. The report points out that while Australia is home to many acclaimed China scholars, few are willing to engage in critical discussions about Tibet for fear of a backlash from the university management or Chinese students on campuses. “Our report shows that the activities of key Chinese donors to Australia’s major political parties and universities are an integral part of China’s global mission to reshape the narrative on Tibet,” Australia Tibet Council’s Campaigns Manager and exile Tibetan parliament member Ms Kyinzom Dhongdue was quoted as saying. “China’s attempts to influence Australia’s foreign policy is a threat to both the Tibet movement and the strength of Australian democracy. Australia’s silence on Tibet contradicts its own values and diminishes its moral standing,” she has continued. The report calls on Australia to uphold its democratic principles and stand up for the Tibetan people by publicly endorsing Tibetan call for freedom and human rights in Tibet, by supporting Tibetan leadership’s efforts to find a resolution with the Chinese leadership, and by meeting the Dalai Lama at the highest level. The report also urges Australia to join like-minded governments to initiate visible coordinated diplomatic action on Tibet. And it calls on the universities to protect their academic integrity by encouraging scholars and students to examine the Tibet issue openly and critically.